Laura Ebert is a Trade Specialist at the International Trade Administration. At the end of last year, 14 companies from the Tampa Bay area in Florida traveled to Santiago, Chile on a trade mission. 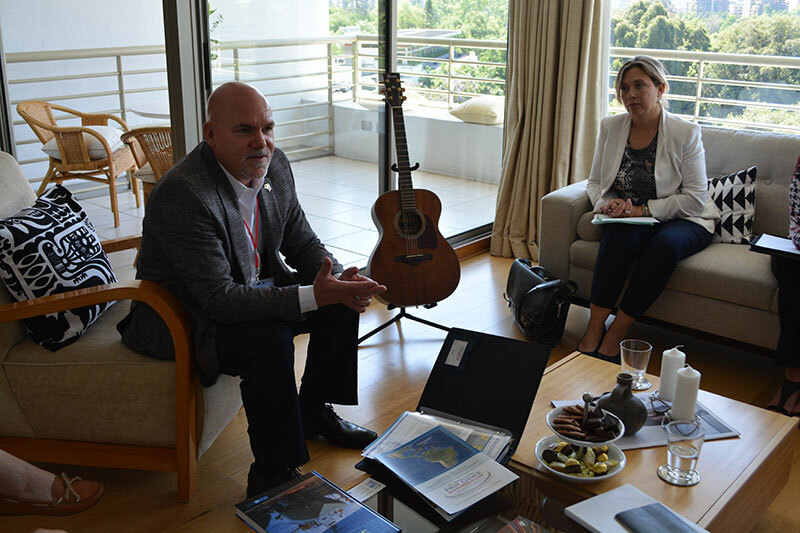 Led by the Tampa Hillsborough Economic Development Corporation, the companies came armed with market assessments and meeting agendas prepared by the U.S. Commercial Service in Chile. Their mission: to find new export opportunities in Chile. Joining a trade mission is a great way to learn firsthand about new export markets and meet face-to-face with potential partners and clients. Increasingly, city, state, and regional organizations are teaming up with the U.S. Commercial Service to offer tailored missions for local companies. What is it like to participate in a trade mission? To find out, we recently spoke with two companies that participated in the mission to Chile. His biggest surprise about Chile? How modern it is. “Most water services are privately operated and run like a business looking for a return,” Conroy added. First Choice Marine Supply designs, manufactures, and distributes solar lighting for the commercial and industrial marine industry, among others. CEO Craig Ruda came across the mission while doing research on expanding to Brazil. He decided to turn his attention to Chile when he learned of the relative ease of doing business there—especially with the Free Trade Agreement (FTA) between the United States and Chile in place. “Given the FTA, Chile’s growing economy, and their interest in new, energy efficient technologies, it just made sense,” said Ruda. Ruda went to Chile looking to gather market intelligence and to meet a diverse client base. For him, nothing beats face-to-face interactions for getting an assessment of the true capabilities of a potential agent and for establishing trust with clients. He was impressed by how comfortable Chilean companies were with importing and surprised by the strength of the infrastructure there. Does he consider the mission a success? “Yes, we met all our objectives,” Ruda said enthusiastically. After all the time and effort put into exploring markets halfway around the world, has exporting been good for business? “Absolutely. Exporting has increased our sales and allowed us to hire,” says Conroy. Hydro-Dyne has doubled its staff over the last two years as exporting has become a larger part of the company’s sales. Exports have driven growth at First Choice Marine as well. “About 50 percent of our market is served through exports. Every one of our people has relationships in other countries on a daily basis,” Ruda added. If you would like to explore export opportunities for your company and learn more about upcoming trade missions led by the International Trade Administration (ITA), visit our trade mission page. For trade missions to Latin American FTA markets led by ITA and state and local partners, visit our Look South events page. This message will not self-destruct. Share it!